Everyone Communicates, Few Connect is a book about speaking in a way that connects with the audience. Author John C. Maxwell makes the point that no matter what you say (even with your body language), you’re communicating something, but it takes more effort to connect with people. Using stories about his own struggles to communicate effectively, first as a church pastor, then as a speaker, the author explains principles and practices that anyone can use to connect. He breaks these down into little steps that are easy to implement. I was surprised at the tone of the book; it’s like a motivational speech, but then I realized that this reflects his personality (and probably the fact that he led a church for a long time). The number one criteria for advancement and promotion for professionals is an ability to communicate effectively. When you are trying to connect with people, it’s not about you—it’s about them. We’ve heard that before, but he goes further and says that you need to actually care about others and try to help them. If you’re looking to work on your speaking technique from the inside out, you’ll find this book helpful. Note: I received a free copy of the book to review. Get a free copy of this book! The publisher has offered to mail out 5 free copies of this book to readers of this blog. If you’re interested, sign up below and I’ll choose 5 winners randomly. The deadline is Monday, September 6th. 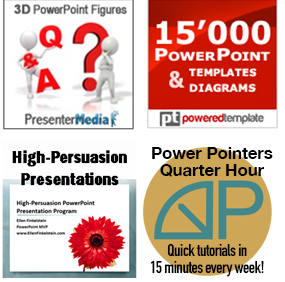 If you’re not already a subscriber to the PowerPoint Tips Newsletter, you’ll also get a free subscription. If you are selected to receive a book, I’ll e-mail you for your mailing address so I can send it to the publisher.